Do We Burden Them with Worry – or Work with Them to Find Solutions? I used to be pretty relaxed. And then I had kids . . . Some nights I find myself awake at four in the morning. There are a million things racing through my mind. One of them is the sorry state of our planet. It is something our children are going to have to face. With the earth’s resources diminishing, pollution increasing, and the population exploding, what kind of earth have we given our kids? Is it fair for us to burden them with one more worry or should we just let them be kids? As a mom, are you supposed to have all of the answers? Kids are way smarter then we give them credit for. With the barrage of daily media options, they are fully aware of the state of our earth. How can we help them tackle a reality we all have to face? I think one way to face this type of quandary is to discuss the issues together. It is okay to let them know that we, as adults, also have fears and maybe let them in on the truth: we don’t always know the answers. I have always had a very open relationship with my children. They can ask me anything and I try and answer them to the best of my knowledge. I am a believer that if kids want to learn something, asking questions is the best way to do this. It is also important to let them know that finding out the answer together will help both of us grow and learn. Maybe the next time we are watching a news report of doom and gloom and the state of the environment is highlighted, we can sit and talk about what it means and what we can do. As I stumble through the unknown world of parenting, I’m finding there are supporters in my corner. Now that my kids are of school age, I realize what a good resource their teachers and peers are. 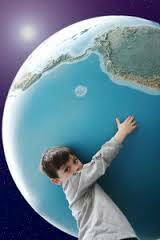 These days, discussion about the environment is part of the school curriculum. They are learning and being challenged in their academic world to think about the state of our planet and what part they can play in its rescue. They also teach me that I have a lot to learn. Kids are sometimes smarter than moms . . .
As you may know, Earth Hour is held in late March every year. It’s a worldwide grassroots movement uniting people to protect the planet and is organized by the World Wildlife Fund. For the past few years, our kids have been vigilant about turning the lights out for the hour. It is something they discuss at school and they come home all gung-ho that we are going to participate. This year they were all prepared. My daughter had some song she wanted us to sing and my son had thought up a word game to play, as we sat in the dark. I, on the other hand, was none too happy about having the lights out for one hour. I made it very clear I had things to do and that it was an inconvenience for me to observe earth hour this year. I must admit I was feeling pretty sheepish. Here were two kids who probably had a million things they would rather be doing and instead they committed to spending that single hour without lights to show their solidarity with all the others who would be participating in Earth Hour. My kids showed me they were willing to lead by example. I was left feeling pretty self-centered and knew I would have to do better. There are days when I do wake up and feel like pulling the covers over my head and staying in bed. Life would be so much easier if we all could do this. But I realize that if my children don’t see some type of optimism from me, then they don’t have a chance. I am a realist and know they will have to go out and face this world. It is our job as moms to make sure they feel comfortable enough to ask the difficult questions. It is only fair that we show them we are willing to start this dialogue…and together we can work on creating some solutions. Ann Lebitka is married and an enthusiastic (and sometimes exhausted) mom of two awesome kids. Ann lives at the corner of “denial” and “someday I’ll fit those jeans I wore at 25.” She works as a part time tutor and full time domestic engineer. To read the other Mothering Matters blogs and/or to sign up to receive the weekly e-mails, here is the link. Your kids are absolutely right: the less we buy, the less we throw away and the less stuff that ends up in landfills. I am very cognizant now about anything I buy…be it new or used. I literally don’t have room to put anything, so now I’m focusing on getting rid of stuff – in an environmentally-friendly way as possible i.e. giving it away. The landfill is my last resort. Great article and comments from two awesome writers – Ann and Maryanne! You both rock!